Happy Earth Day! 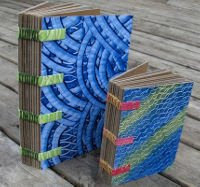 Several members of BEST like making books with reclaimed and repurposed materials. 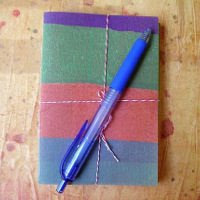 If you need some ideas to get started on the path to making eco friendly journals, have a look through these. 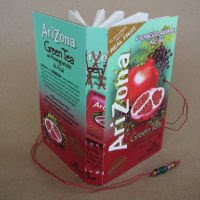 Cover made from an Arizona Pomegranate Acai Tea box, reinforced with chip board and tyvek for strength. The covers are a material that was made by fusing and dyeing plastic shopping bags. Creates a materials that is waterproof and rugged. 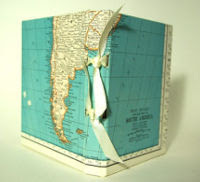 Made from cardboard scraps, each containing 10 cardboard sheets and covered with paste paper on the covers. Cover is made from a discarded advertising poster that was coated with vinyl. 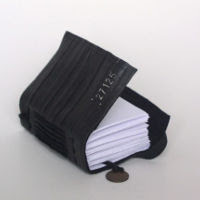 The cover is made from a bicycle tire inner tube that has been reinforced to make a sturdy cover, and includes an elastic closure. 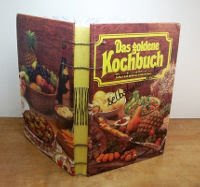 The covers are salvaged from a 1970s cookbook to make this lined journal, which also contains a few photo pages from the original cookbook. 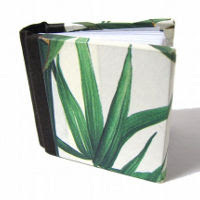 This books is covered with an upcycled map, and the pages in this book are 50% sugar cane, 30% post consumer, and 20% recycled fiber (so no new trees were used). 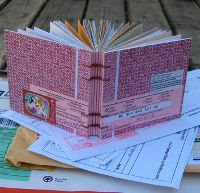 The covers are scraps of mat board and all the pages are previously used envelopes and other materials that have been through the postal system. 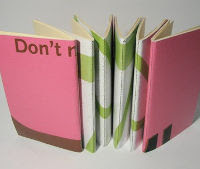 The covers are made with a couple discarded wood blocks, covered with the bamboo paper to make a chunky little book.